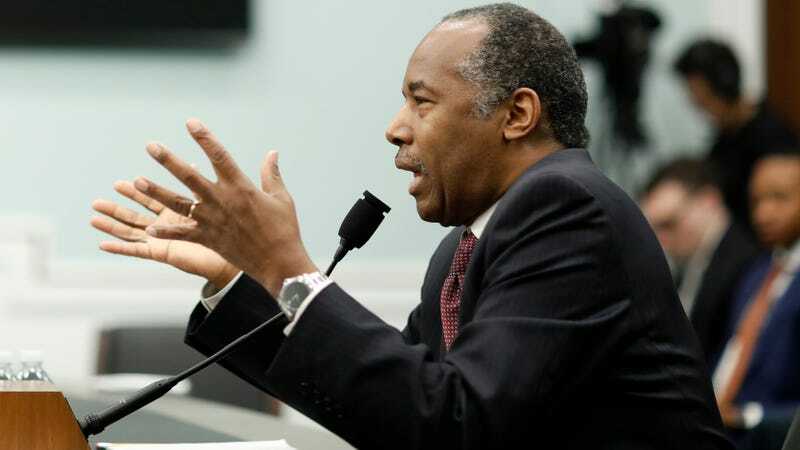 The $31,000 dining set that Ben Carson bought for his office at the Department of Housing and Urban Development wasn’t his fault, guys. It wasn’t! It was Candy. It’s always Candy!! This news comes courtesy of the following tweet, which nicely encapsulates how quickly Carson will move to throw his wife under the wheels of an oncoming bus and that he seems to think it is normal for a cabinet member to let their spouse spend shitloads of public money! Let’s fan fic this scenario. SCENE: Ben and Candy Carson, standing in a furniture warehouse clutching a comically-large credit card that reads FROM THE BANK OF YOUR MONEY, SUCKERS. Ben selects a hideous (but affordable!) hutch, the table, the chairs, and then, overcome with exertion from standing upright for more than five minutes, falls asleep on an overstuffed ottoman in the corner by the credenza they considered, but did not actually purchase. Candy, sensing an opportunity, goes to the $31,000 Tables Section and, well, the rest is history.